Glaucoma is a disease of the eye which exhibits a typical optic neuropathy which results in progressive visual field loss.The most important risk factor is raised intraocular pressure.Risk factors for glaucoma include age above 40 years, diabetes, myopia, mature cataract, trauma, certain retinal diseases and a family history of glaucoma. It is commonly caused by obstruction to the drainage channels of the eye. Although infants and children can rarely be affected, glaucoma is more common in the adult population. The raised pressure can cause irrecoverable damage to the optic nerve and can result in permanent loss of vision. 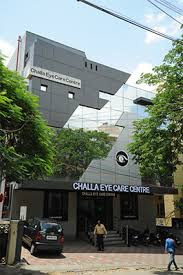 At Challa Eye Care Centre the patient is investigated thoroughly with use a of Perimetry, Ocular coherence tomography (OCT) and then the treatment is personalized to the patient to maintain his vision and quality of life.